Darren's Outdoor Page - The Way I See It: Europe Bound Rip-Off! The Way I See It: Europe Bound Rip-Off! Hello again. Today I'm going to talk about what I saw when I recently went to Toronto to visit MEC. If you read my site frequently, you'll know that I love MEC (Mountain Equipment Co-Op). It's my favourite store ever. Anyway, when I went to Toronto to visit MEC, I also went across the street to Europe Bound. Europe Bound is a "Travel Outfitter" and they have set up shop across from MEC in Toronto, most likely to get some business. Now, I don't have anything wrong with that. Other stores are also benefiting from MECs presence in T.O. There's a second outdoors store not far away, and Trailhead just opened a new store close-by too. Fine... I have no problem with that, because I like to visit those stores too when I'm in the area. What this is really about is how Europe Bound is ripping off MEC. As I mentioned earlier, I love MEC. There are many reasons for this. One, they make a quality product. Two, it's at a decent (read reasonable but not cheap) price. Three, they have a strong commitment to the environment, and a 'moral' way of doing business. These are all very good reasons why MEC is great. Also, they spend a lot of time, money, etc. when they design their products. I don't know this for sure, but it's evident when you look at the product and all of the small details they think of. Anyway I'm off track again, cause I don't want to talk about why MEC is great, I want to talk about why Europe Bound is a rip-off. OK. As I walked across the street from MEC into Europe Bound, I immediately saw a rack with a pair of pants on it. These pants looked exactly like the popular MEC Rad pants. However, upon closer inspection, these pants turned out to be cheap knock-offs of the successful MEC product. Hmm....why would the company sell a product that looks the same? At the time, I didn't think much of it. But, as I looked around the store more, I noticed that a lot of the products with the "Europe Bound" house-brand logo on them were copies of MEC products. Fleece jackets, day packs, geez! What's going on?? On the way out of the store (I didn't buy anything), I picked up a copy of the Europe Bound catalog. I became even more upset when I flipped through their catalog. What the hell?? Not only do the products look the same, they use almost the same descriptions as the MEC catalog does. I'm going to give some examples below, copied straight out of the two catalogs. See for yourself what I mean. OK. First off, lets look at the MEC Verglas Jacket. 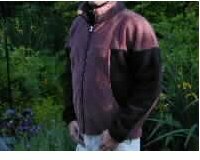 An interesting fleece jacket that uses 3 kinds of fleece. Here's what the MEC catalog (Fall/Winter 2000) has to say: "A garment that offers warmth with minimum bulk and maximum freedom of movement. It's cut close to the body to eliminate bunching up when layered under a shell garment. The front and yoke are made of Polartec® 300 Patented Construction fabric for warmth. Polartec 200 Stretch fleece over the ribcage and back enhances movement and ventilation. Polartec Power Stretch® inserts under the arms allow the greatest mobility and ventilation where they are needed most. Two low profile handwarmer pockets and a high collar provide cosy comfort in blowing cold. This jacket is also quite distinctive looking. Now, the Europe Bound Whistler Fleece Jacket looks quite similar to the MEC Verglas. However, upon closer inspection there are some differences. Now for the kicker though. Here's the catalog text from the Year 2000 Europe Bound catalog: "Superior warmth with freedom of movement. Two types of fleece used - Polartec 300 fabric in the yoke and front give warmth while Polartec 200 Stretch fleece along the sides and back enhance movement. Two front zippered pockets. 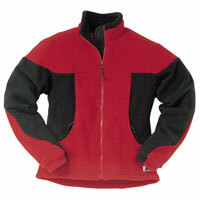 Double fleece collar for added warmth." Fine! What's wrong with that. Nothing I suppose...although the choice of words is quite similar. I'm not saying that they copied from the MEC catalog, but it sure seems that they made a very similarly structured description...using quite a few of the same words. Notice the choice of vocabulary - "yoke" - not a very common word, but just happens to be in both descriptions. "Freedom of movement," "enhance movement," things like that. I realize that these words are used often, but there are other ways of saying it! Sure, I may be over reacting, but hey! And even if the description was only coincidentally similar to the MEC catalog, that doesn't change the fact that the product looks the same! As I first mentioned, it's not just this jacket that is similar to other MEC products. There's also daypacks, pants, etc. If you have an older MEC catalog handy, check out the MEC "Expresso" day pack. (I say "older catalog" because it's not in their new one.) Notice how this pack is quite distinctive looking...not a standard design/shape or even colouring. I'm sure if you have a catalog handy you'd agree that it is a distinctive pack. Now, in the Europe Bound catalog they have a surprisingly similar looking pack.. which would be enough to make me suspicious. However, the best part of this one is the name. Notice that the MEC pack is called "Expresso". The Europe Bound pack is called - get this - Cappuccino. Now..either someone at Europe Bound is drinking a lot of coffee and just randomly decided to name their pack after their cup of joe, or they made a pack very similar to the MEC pack, but were too dumb to come up with an original name, so instead of making it too obvious by using the same name, they used a different coffee name! Smooth...no one will ever catch on! Way to go Europe Bound! Your marketing people are amazingly talented. I'm sure I could find more products that are similar, but I guess if you're not convinced by now you're never going to be convinced. Now, you may be asking, "How do you know that MEC came up with the product before Europe Bound, and that MEC isn't copying Europe Bound?" The answer to that question is that I don't know this for sure. However, if you noticed in the Verglas/Whistler jacket argument, the MEC jacket is infact made with three kinds of fleece, and each has a purpose. However, the Europe Bound model has only two kinds of fleece, and that's only because they want it to look like the MEC jacket. Because the MEC product is well designed and the Europe Bound appears to only mimic their design I would say that Europe Bound copied MEC. Either that or MEC looked at the existing Europe Bound product, then improved on it. If that is the case, then they didn't really "copy" it anyway! I guess the easy way to determine this is to see who came out with the product first. For that I would need an older Europe Bound catalog, which I do not have. I do know that MEC has made the Verglas since at least 1998. MEC no longer makes this jacket, as they have newer models. If Europe Bound discontinues this design as well, I would be amused! Anywho, I guess that's all for now. All I want to say is that I really have nothing against Europe Bound, I just find it quite amusing! However I'd also ask people to consider what they are supporting if they buy the knock-off product. If you really need to save that extra couple bucks, buy the Europe Bound stuff, but if you want to support the company who designed the product, and also makes it of a higher quality, then please buy the MEC product. Note that I do not work for MEC or Europe Bound, and never have worked for either one. And I guess that's all I have to say about that! After the posting of this article, I've recieved some feedback from an interested reader. Below is the e-mail correspondence regarding this subject. It provides a different prospective of the situation that I urge you all to consider before forming any personal opinions. This middle aged canoe nut found your site by accident, and really enjoy it. It's pleasing graphically, informative, and not too serious, unlike many such sites. (Lighten up, guys). But as an entrepreneur (Timothy's Coffees - 150 stores in Canada and US), I take issue with your Europe Bound comments. Joe Raftus should not knock off designs exactly, nor should he steal ad copy. But MEC did not "invent" all their designs, have long "improved on designs" (read 'copy') though they no longer use such controversial English. They're guilty too, even if they are a bit more subtle. And unlike MEC, Europe Bound and all the other little entrepreneurs (1) pay income taxes, not a small factor in any business. (2) And with over a million members at $5, I estimate the MEC has $7 million in de facto capital, capital which an entrepreneur has to borrow, or generate from after-tax income. When one party pays no income taxes, and has $7 million in "free capital" is it a level playing field? I think not. On the other hand MEC contributes plenty to environmental and other projects. They helped finance some friends of mine and me rebuild the trails at Kolapore Uplands, for instance. I don't think MEC is a retailing Darth Vader, nor the little guys squeaky clean. I do think the issue is a bit more complicated than you imply. But keep up the good work - I enjoy your trips vicariously. And if you're ever downtown Toronto and wish to debate the above points over the best cappuccino available anywhere in the world, one which could not possibly be knocked off by Starbucks, Second Cup, or anyone else, drop me a note. I'd enjoy it. My appologies for the late reply, but I'm finishing my summer job/starting a new term at school, and just moving into a new house, etc. Also, I'm glad that my Europe Bound article finally produced some feedback... I was beginning to wonder if I was the only one who feels this way. Firstly, I'm intrigued at the notion that MEC pays no income taxes. I suppose I've never thought about it before, and know very little about business, so I thank you for pointing out this fact. I can see how that would make a rather "unfair" advantage for MEC, as opposed to the "little guy." I do agree with what you say that "...the issue is a bit more complicated than you imply." I didn't mean to say that I thoroughly reserched the issue and came up with hard facts, as this is FAR from the truth. I can see how reading my article gives a slightly biased point of view, and since I have no facts, I suppose it's a moot argument to begin with. However, since it was written as a 'spur of the moment' type of thing, it is mostly my gut reaction to the situation. I make no appologies for what I feel, but do realize there may be another side to the argument. In the interest of a fair argument, and not causing anyone any trouble, I ask that I be allowed to post your email on my website below my article (of course names, email addresses, etc can be deleted or changed, and your company can remain nameless if you so desire.) If this idea appeals to you, please let me know. Also, I welcome any further discussion, as I'm sure I have much to learn about the matter. As for your invitiation, if I'm ever in Toronto [to visit MEC of course :) ] I will look you up and maybe stop by for a chat!